The 51st running of the biennial offshore classic- the Newport to Bermuda Race was a relatively benign affair, with maximum winds barely pushing 15 kts and most of the time chasing zephyrs and wind-streaks across the Atlantic Ocean. And, with 75% of the fleet finishing between midnight Tuesday and Wednesday morning Bermuda time, it was more like a giant “raft-up in company” kind of race. There were no outliers either east or west that did well. Just about everyone could see each other the whole race and if you launched a drone up to 5,000 ft (easy to do), you would have captured half the fleet in one shot! The action started at 1300 hrs EDT Friday, June 15 from Newport, Rhode Island, just beneath the famous Castle Hill Inn and Lighthouse at the port end of the starting line. It was not the “thrilla from Manila”, more like a slow and steady progression, trudging slowly along in the serpentine line walking through Chicago O’Hare’s security line, all heading somewhere along the 162-degree rhumbline to Bermuda. The forecasts held true, the light northerly dying and the SSE winds building slowly from 4-6 kts at the start to SSW winds offshore overnight. Thank goodness it was a strong ebb-tide at the first starting gun at 1305 hrs. Had that not been the case, the start would’ve been chaotic. As the final Maxi Class and Superyacht Class’s started, the fleet was well on its way to the Onion Patch with SSW winds of 7-12 kts. The vast majority of the fleet endured a rather bizarre scenario offshore. The big, fast boats basically rode the remnants of a micro-Low, then micro-High to whisk them along to Bermuda; specifically, the Gibbs Hill Lighthouse division maxis- Rambler 88, the Maxi 72 Proteus, and the two Volvo 70s. They all separated quickly into a separate system with a moderate northerly flow and rode it to Bermuda to make up the top five overall in the Gibbs Hill division. Behind them, the weather systems simply deteriorated into nothingness, with wind veering back into the northerly quadrants and dying, with numerous “park-ups” from east to west across the rhumbline for the main body of the fleet. Ultimately, the forecasted southwesterlies and westerlies from an approaching front materialized and those that held to the west of rhumbline faired better than their colleagues off to the east. Benefitting from that unfolding scenario was David Southwell’s J/121 APOLLO, finishing at twilight on Wednesday at 0322 hrs for a corrected time class win of 62:21:35 hrs (elapsed of 108:12:52) in the Gibbs Hill Lighthouse Division Class 14. Taking third in class the Leonid Vasiliev’s custom J/120 DESPERADO correcting out just 30 minutes back. 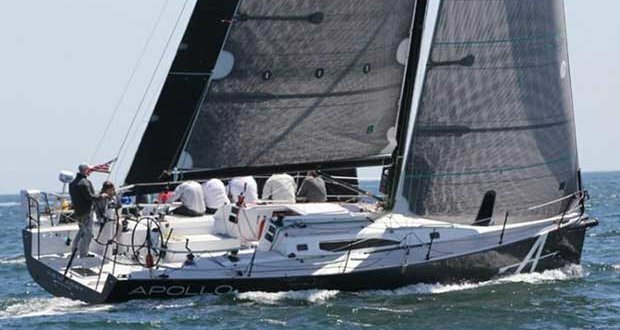 As a result, overall under ORR Handicap, the J/121 APOLLO was sixth corrected time behind the obvious winners in the “breakaway” group in front of the fleet- the two Volvo 70s, Maxi 72, Rambler 88, and a TP52. Fast company, indeed! A great debut offshore for Southwell’s team! Similarly, the two J/121’s sailing in the St. David’s Lighthouse Division Class 9 (Joe Brito’s INCOGNITO and David Southwell’s ALCHEMY) sailed fast, but ultimately made a fateful decision around 1400 hrs Monday afternoon, gybing east nearly tangential to rhumbline to head further east. It was a move that would seal their fate after leading for much of the race. They were caught a bit too far to the east as the forecasted SW to W winds filled in. As a result, despite alternating provisional leadership of their class halfway through the race, both boats ended up finishing nearly at the same time as their sistership APOLLO. Joe Brito’s INCOGNITO finished at 0246 hrs Wednesday to take fourth in class, and David Southwell’s ALCHEMY finished at 0336 hrs to take fifth. In the St David’s Lighthouse Division Class 6, Andrew Hall’s J/121 JACKHAMMER suffered a similar fate as INCOGNITO and ALCHEMY, getting just a bit too far to the east Monday afternoon as the southwest/west winds started to drift across the race course and power everyone in the big pack on starboard tack towards Bermuda on fast-reaching angles. As a result, they took the bronze in their class, missing the class win by just over 40 minutes- easily the distance they gave up going too far east. In the Double-handed Division Class 3, Steve Berlack’s J/42 ARROWHEAD sailed a strong race, working their way to the west of rhumbline at the appropriate time on Monday afternoon and reaped the benefits to take the bronze! Taking fifth place was Gardner Grant’s J/120 ALIBI. In the SDL Class 5, Fred Allardyce’s J/40 MISTY managed a third, while Eliot Merrill’s J/42 FINESSE placed fifth. What was tantamount to being the sole “J/Boats” division was SDL Class 7- six J/120s and four J/122s in a class of fourteen boats! The very experienced J/120 teams (many whom have multiple Bermuda Races to their credit) swept the first four spots; leading was Rick Oricchio’s ROCKET SCIENCE, second Richard Born’s WINDBORN, third, John Harvey and Rick Titsworth’s SLEEPING TIGER, and fourth Brian Spears’ MADISON. All went west of rhumbline at the critical juncture of 1600 hrs on Monday afternoon heading for the southwesterlies. The first J/120 beat the first J/122 into the island finish line by over one hour. With a number of Bermuda veterans, it was going to be interesting to see how the SDL Class 8 would unfold. In the end, it was Mike McIvor’s J/133 MATADOR that salvaged (believe it or not) a third place on the podium after leading boat-for-boat of all J’s for the first 2/3 of the race. Yes, it was the same SW/W gradient that nearly did them in too by getting a bit too far east. Taking fifth was Len Sitar’s J/44 VAMP and sixth was Chris Lewis’ KENAI. In the Finisterre Division (cruising class) Class 13, Howie Hodgson’s J/160 BLUE took fifth place. In the final analysis, perhaps the most shocking statistic is that out of the 29 J’s racing Bermuda, fully half of them managed a top five finish in class! As for podium finishes, two Golds, one Silvers, five Bronzes for a total of eight medals- nearly 1/3 of all J/teams entered podiumed. Pretty good odds/bets in the greater scheme of things! As J/sailors have learned/ discovered over time, a well-balanced boat that can sail in all-around conditions ultimately prevails, and often wins!